Joshua S. Haynes presents this week’s Brown Bag Lecture at noon February 13. Haynes is an ethnohistorian at the University of Southern Mississippi who researches, publishes, and teaches early American and Native American history focusing on themes such as colonialism, violence, and state formation. 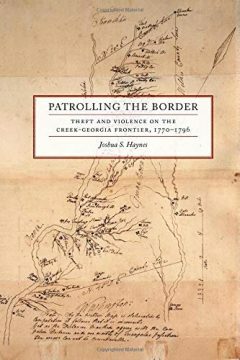 His book, Patrolling the Border: Theft and Violence on the Creek-Georgia Border, 1770–1796, focuses on a late eighteenth-century conflict between Creek Indians and white settlers. The conflict was marked by years of seemingly random theft and violence culminating in open war along the Oconee River, the contested border between the two peoples. Joshua S. Haynes argues that the period should be viewed as the struggle of nonstate indigenous people to develop an effective method for resisting colonization. It was published by the University of Georgia Press in 2018.